I pride myself on being very creative and resourceful. Those strengths--I use in every facet of my life even cooking. I tend to browse through my refrigerator for ingredients to use in a different way every time I cook. I made some fruit infused water and had extra mint that I neeed to make sure I used rather quickly. 1. Rinse and clean chicken and season with meat tenderizer, season salt, and salt and pepper-if desired. Sit aside. 2. Preheat the oven to 425 degrees. 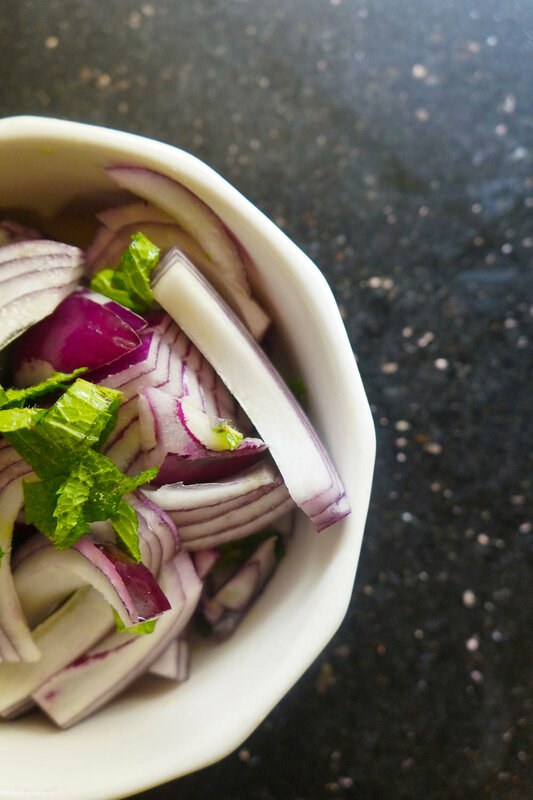 In a medium bowl, toss the onions, olive oil, and the 2-3 leaves of mint. Season the onions with salt and black pepper. 3. In a small bowl, mash the butter with the garlic, Aleppo pepper, lemon zest and the remaining mint, season with salt. Rub the seasoned butter evenly on the skin of the chicken. Set the chicken in a roasting pan with a little bit of water at the bottom. 4. Roast for 20 minutes. Add the onions to the pan, reduce the temperature to 375 and roast for 20 more minutes. Squeeze the lemon wedges over the chicken and add to the pan. Roast for an additional 35 minutes longer. Remove from the oven and allow to sit for about 10 minutes. 5. Lastly, return the pan with leftover red onions and lemon wedges and roast for 10 minutes. 6. Serve with all of the juice and onions in the pan.